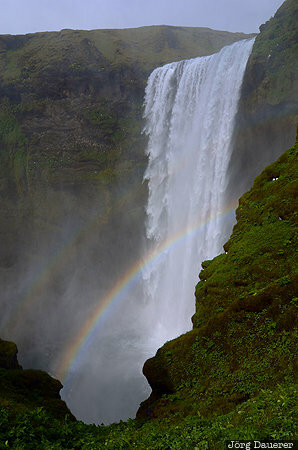 The sun peaked out of the cloud cover for a few minutes and created a rainbow with the spray of the impressive waterfall Skógafoss near the village Skógar. Skógar is in Suðurland in the south of Iceland. This photo was taken in the early afternoon on a cloudy day in June of 2012. This photo was taken with a digital camera.